Please excuse this departure from my normal content, but I felt like some folks would appreciate this recipe. I almost never bake or eat sweets, and this recipe required a trip to the grocery store for chocolate, flour and sugar. 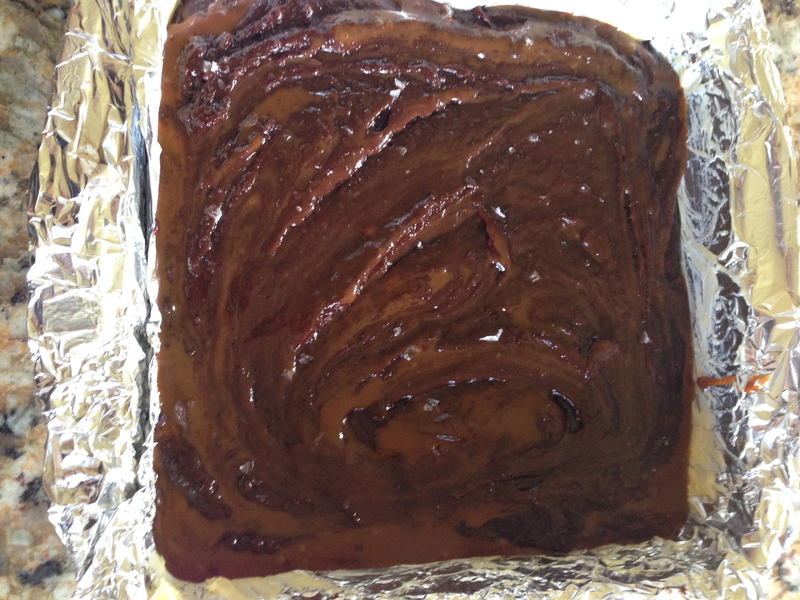 Recently I was poking around on Pinterest, and saw a recipe for Dulce de Leche Brownies, by David Lebovitz. I have had a jar of Blue Heron Farm Bourbon Cajeta in my pantry for a while, and thought the substitution might be magic. When my mom called today to let me know they had out of state visitors coming to visit tomorrow for a few days, I decided to give it a whirl and make them something special to serve to company. 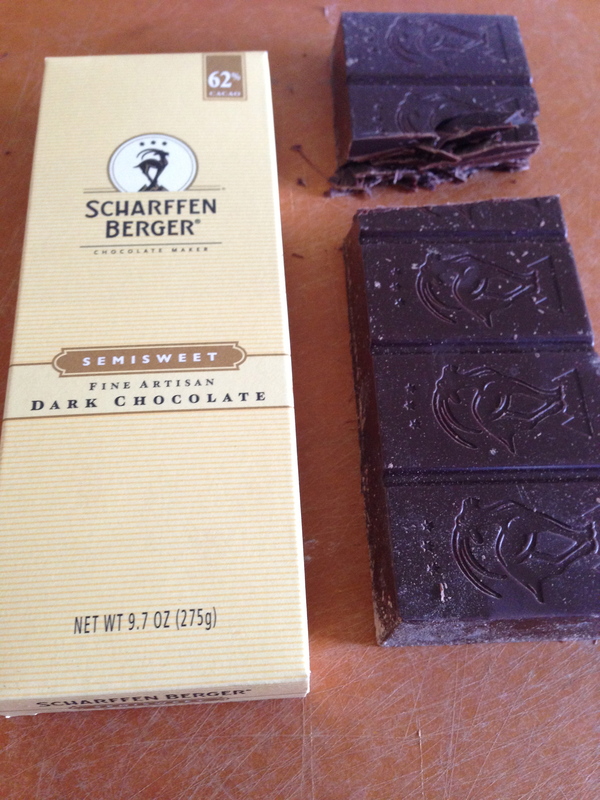 The recipe called for either unsweetened or semi-sweet chocolate. I used Sharffen Berger semi-sweet. It’s quite an easy recipe – Melt the butter, mix in the chopped chocolate, mix in powdered chocolate, 3 eggs, 1 cup sugar, 1 cup flour, vanilla (I used my homemade). It makes for a very rich batter. I mixed everything in the saucepan I melted the butter in. Using a boxed mix might be marginally easier, but not by much, and this way, you control the ingredients. You spread half of the batter in the foil-lined, buttered baking pan, then pour in half of the cajeta and spread it around, without mixing it in. I used unsalted butter for this recipe, then just prior to baking, sprinkled a little Maldon Sea Salt on the top of the batter, because salt is an amazing complement to both chocolate and caramel. 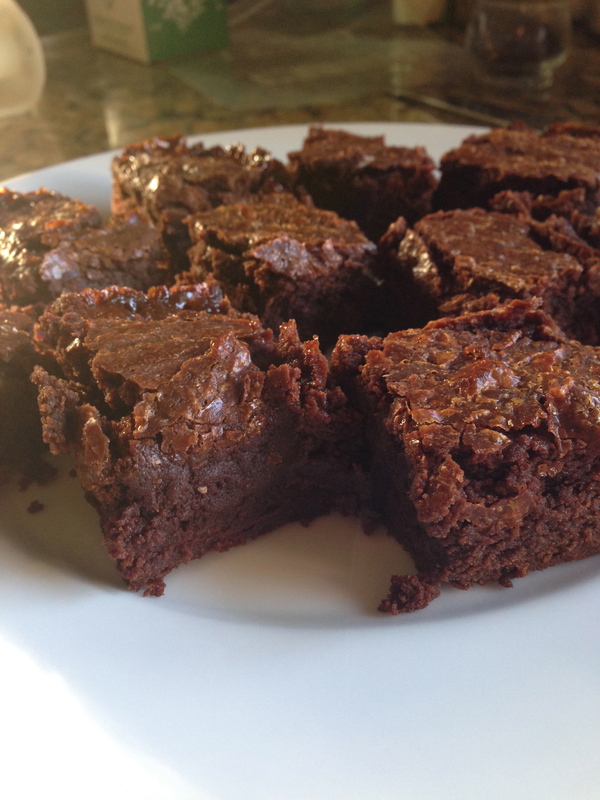 Once the brownies cooled, I peeled away the foil (I think I would skip the foil next time) and club them into squares. 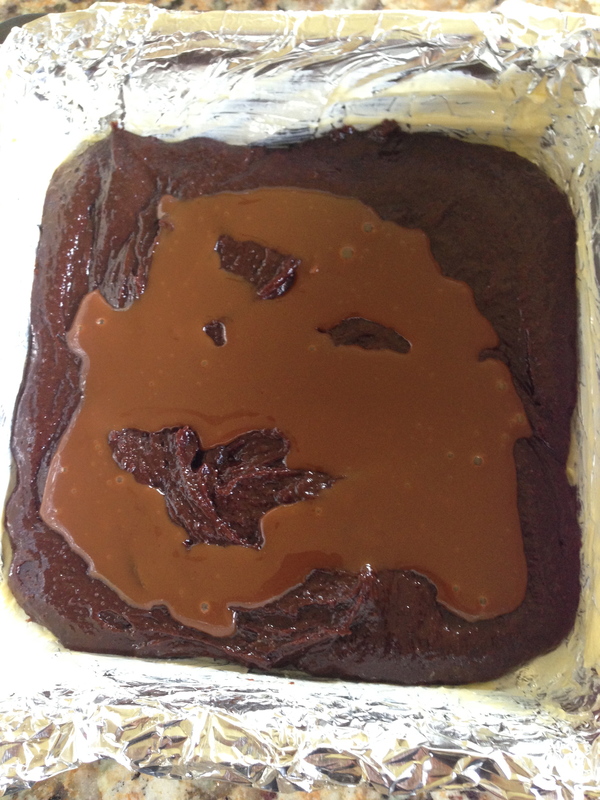 I had hoped for a little cajeta, brownie definition, but it all just melded together into a very chocolatey, caramel bite of yumminess. I delivered them just now, and my parents loved them. Hopefully, they will save some for company. 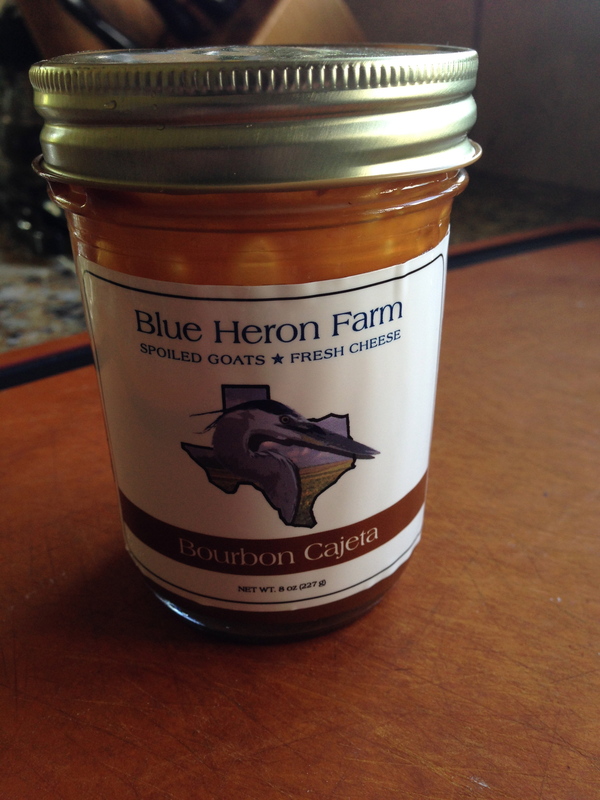 Blue Heron Farm Cajeta and Bourbon Cajeta are usually available at Antonelli’s Cheese Shop. If you are lucky, you can also find their fresh chevres at the shop, but they sell out fast. They can be found at the Houston Farmer’s Market – Rice University on Tuesdays, the Urban Harvest Farmer’s Market on Saturday’s and do follow them on Facebook for the cutest goat pictures you’ve ever seen. 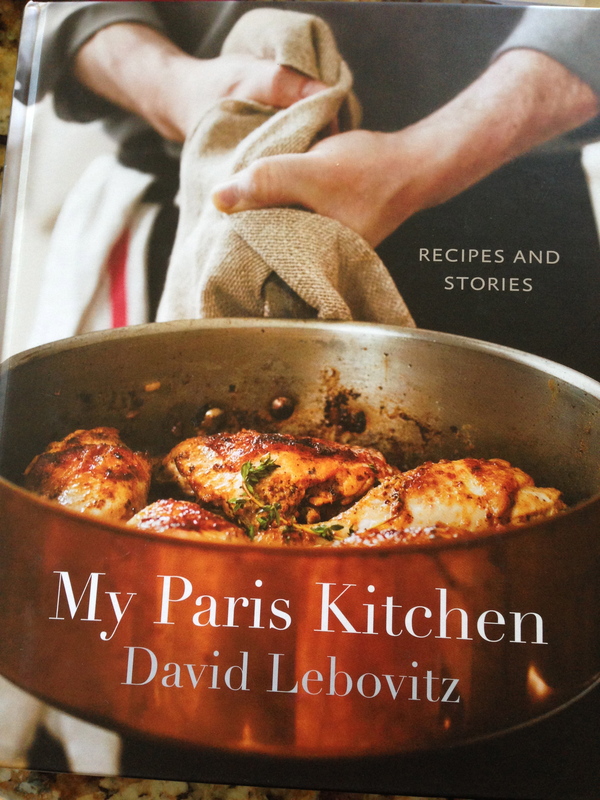 David Lebovitz is the author of The Perfect Scoop, Ready for Dessert, The Great Book of Chocolate, The Sweet Life in Paris and his most recent cookbook My Paris Kitchen.